When Dwayne Johnson announces a new project I pay attention, when that project involves one of my favorite writer/directors Shane Black, I give it my undivided attention. The pair have come together for Sony Pictures’ ‘Doc Savage‘. Shane Black is directing from a script he co-wrote with Anthony Bagarozzi (‘The Nice Guys‘)and Charles Mondry (‘Jekyll‘). Black is an amazing writer and responsible for the ‘Lethal Weapon‘ film series, ‘The Last Boy Scout‘, ‘Kiss Kiss Bang Bang‘ and ‘Iron Man 3‘. When Black was promoting ‘The Nice Guys‘ he stated the his pic for ‘Doc Savage‘ was Johnson and this morning Johnson made his involvement official. 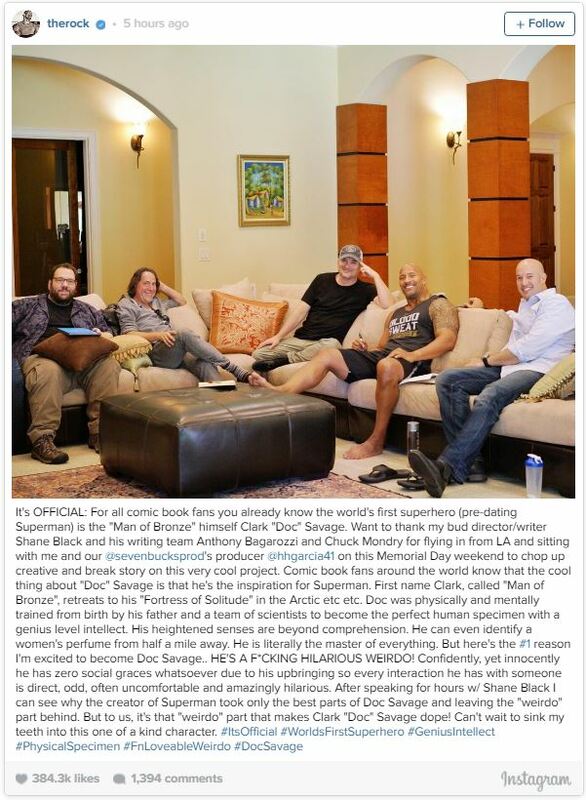 In addition to starring, The Rock will also produce through his Seven Bucks Productions with Hiram Garcia. The two join an already attached production team of Neal H. Moritz, Ori Marmur and Michael Uslan. This entry was posted on Monday, May 30th, 2016 at 1:56 pm	and is filed under Comics, Film, News. You can follow any responses to this entry through the RSS 2.0 feed. You can skip to the end and leave a response. Pinging is currently not allowed. « Get Ready For The Upcoming Season Of ‘Gotham’ With The Complete Second Season On Blu-ray and Digital HD!! !